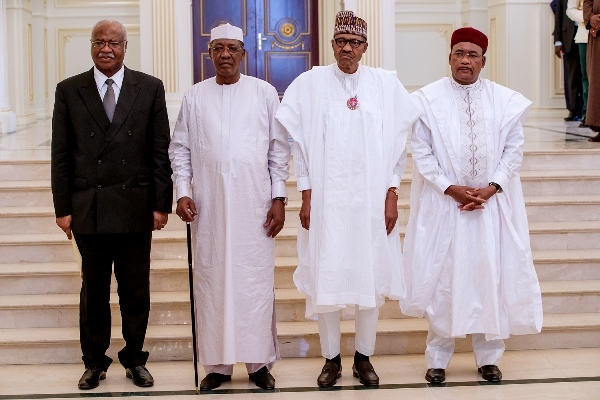 President Muhammadu Buhari has returned home after the meeting of Heads of State and Governments of the Lake Chad Basin Commission (LCBC) where he renewed calls for stringent measures against insurgents. The meeting involved Chad, Niger Republic and Republic of Cameroon to carry out a fresh onslaught against insurgents, particularly the Boko Haram group. Aside Nigerian President, others at the meeting are President Idris Deby Itno of Chad, President Mahamadou Issoufou of Niger Republic, and Prime Minister of Cameroon, Philemon Yang, who represented President Paul Biya. At the meeting on Thursday in N’Djamena, Chad, Buhari renewed call for quick interventions and measures to curb the menace of Boko Haram insurgency in the Lake Chad Basin. The meeting was called to address the recent upsurge in terrorist activities in the region. “As you are aware and have witnessed in recent times, there are new developments of security concern in our sub-region. “The group’s renewed strategy of increasingly mining the general area as well as its recent deployment of Unmanned Aerial Vehicles (UAVs) for surveillance activities have proved to be critical factors in the resurgence of attacks in the region,” Buhari explained at the one-day meeting.